» Forum » Tech » Tech: Alpha-numeric » Can I use System 11 MPU in 11A game Pinbot?? » Can I use System 11 MPU in 11A game Pinbot?? Can I use System 11 MPU in 11A game Pinbot?? Can I use a System 11 MPU from Grand Lizard in Pinbot System 11A? I realize the obvious difference is the 8 segment diagnostic display vs. the 3 red LEDs. I know this question has been circulated before but I am very unclear of the conclusion. My Pinbot 11A MPU board burned beyond repair, and the Rottondog board sounds terrible. I can't find a used 11A MPU board for sale without being totally ruined by battery leakage. 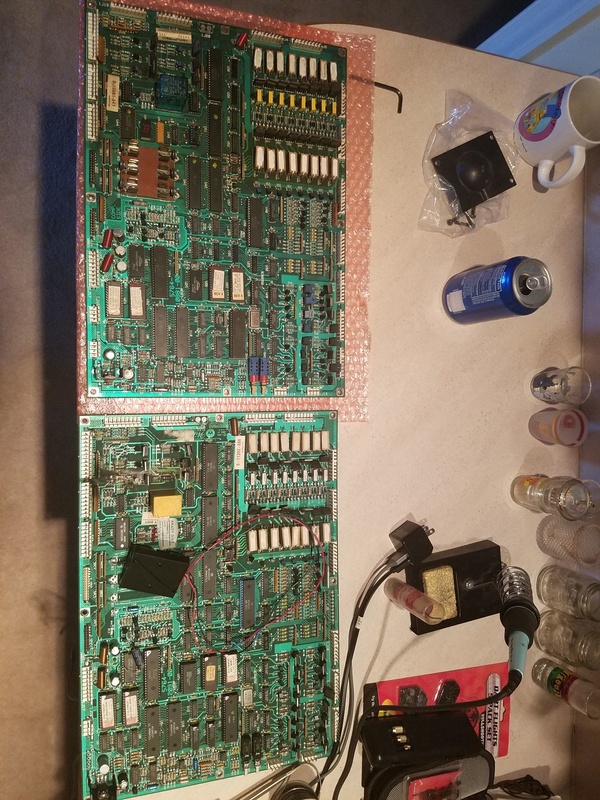 So - I found a System 11 board for sale that came from Grand Lizard. As that game had the MPU mounted 180 degrees the other way, its battery leakage was minimal / repairable and went to the edge of the board on the resistor network. This is unlike 11A boards where the leakage runs into the center of the board and really destroys complex components. Pinbot is a weird one because it was at the transition between 11 and 11A. Most of my concern is with the sound, as it seems Williams kept changing the sound components on the MPU and sound card from one game to another. 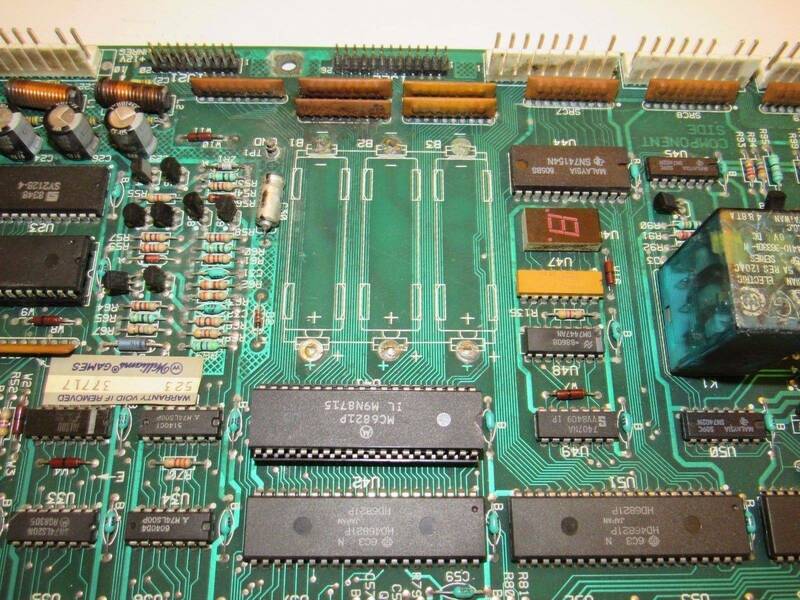 The seller of this board says he's seen dozens of Pinbots with a System 11 (not 11A) MPU boards. What say the experts? (here's the 11 board I'm getting). As a side benefit, it should apparently be backwards compatible with System 9 games (after upgrading the roms). Absolutely, just swap the roms. Here's a good reference. The System 11 board is quite flexible, you can also use it in 11B and 11 C with some modifications. The least flexible CPU boards is system11c, since the sound circuit is completely removed, and a separate sound board is used. This board can only really be used in system11C games because of this. Populating the missing sound section on a system11C board would be difficult, as some of the sound chips are hard to find (and expensive). But the system11c CPU board *can* be used in many sys11/11a/11b games if the accompanying D-11581 sound is used too. The most flexible CPU board is system11A. 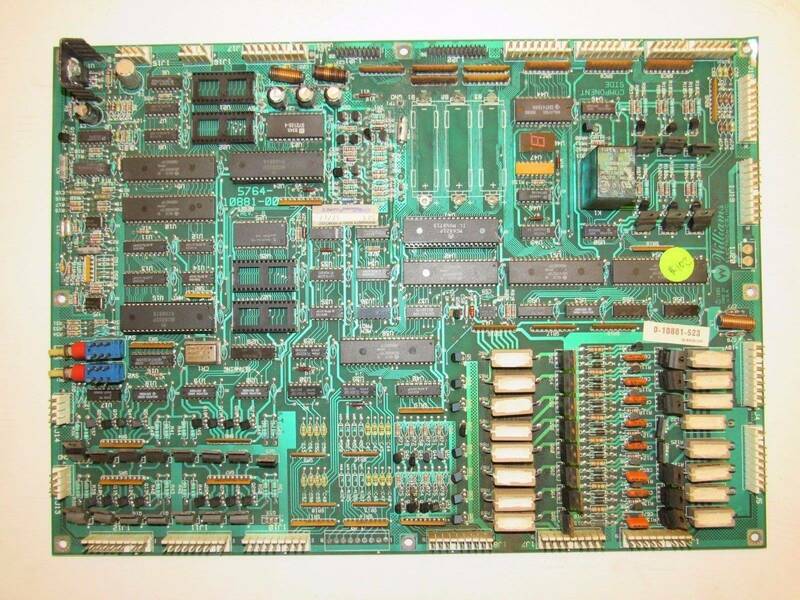 The system11A CPU board can be used in any 1986-1990 sys11, sys11b or sys11c game The only exception is if the sys11A CPU board is going into a original sys11 game (High Speed, Road Kings, or Grand Lizard). In this case, connector 1J15 (four pins, .156" molex male header) must be added to the sys11a CPU board (that's all that needs to be done). To use a system 11a board in a system 11c game, don't use connectors 1J16 (volume control) and 1J15 (speakers). Also the sound ROMs at U21 and U22 are not used, since they are moved to the sound board. The original system11 CPU (as used in High Speed, Grand Lizard, Road Kings) is also very flexible, after the CPU board is modified slightly. It can work in any sys11, sys11a, sys11b or sys11c game with these modifications. CPU connector 1J18 pins 6,7 must be run to ground, otherwise the special solenoids will not work in sys11b and later games. Also there are six 1N5234 6.2 volt zener diodes that should be added to the back of the CPU board. If using a system11 board in a system11c game, just don't use CPU connectors 1J16 (volume control) and 1J15 (speakers), and the sound ROMs at U21 and U22 are not used. System11B CPU board are also very flexible, and can be used in any System11A or 11C game. However the system11B CPU board will not work in the four original System11 games (High Speed, etc.) though, because of the missing amplifier circuit. System11B will also work in a System11C game - just don't use CPU connectors 1J16 (volume control) and 1J15 (speakers), and the sound ROMs at U21 and U22 are not used. The System11b CPU board is not quite as flexible as System11a or System11, because 11b is missing the U1 sound amplifier and associated parts. The System11b CPU will work "as is" in a system11a or system11c game. But these sound part must be added back for a System11b CPU board to work in a System11 game (High Speed, Road Kings, Grand Lizard). If using a system11b board in a system11c game, the CPU sound ROMs at U21 and U22 are not used. Thanks for the information. Here's the leak area, being on the outer edge of the board (thanks to Grand Lizard) instead of going in toward the center, usually hitting U41 & U42 like most of these boards. I hope it can be repaired! With Rottendog not really being a good option and PinballPCB.com stopping production, there's basically no good replacement board options for a long and legendary list of games. It would almost be easier to buy an entire System 11 pinball machine than to find just a working MPU board for sale. Sure wish Alltek Systems could do something for System 11. From what I've read the Rottendog board doesn't work well with the way the sound is done on the Pinbot machine. If the Grand Lizard board doesn't work out I still have a spare Pinbot board. It needs some traces repaired under the battery holder and needs to be tested. I had planned on rebuilding it as a spare but don't really need it and don't know when I will get to it so could sell it as it is. Correct, in my experience. I replaced my original with a rottendog and all the sounds are still present; some are different, muffled. Pinbots voice is a little different sounding and some of the contact noises are muffled. The board runs flawless, after a week the differences in sound seem normal. Very happy with the rottendog! Than you Robotworkshop for offering up your 11A board. PM sent! I have a lot of people telling me they have sound problems with the Rottendog board. Several videos on Youtube show it. Even the retailer who sold me the board warned of these complaints before I decided to buy it. I know that Rottendog produced several versions of their system 11 board and perhaps it depends on which version one is using? I can tell you on my Pinbot the speech is so loud it sounds like you are going to blow the speakers. Even if I turn the master volume completely off, The speech is too loud. Meanwhile the background music cannot be heard at all because the volume is too low on the music. I tried the same board in Swords of fury that uses a different sound board with 11 B and still had a similar problem. Also it is pretty clear that Williams made lots of changes to their soundboards from one game to the next and I'm pretty sure a Rottendog could not cover 100% compatibility on all those changes. I noticed that almost no retailers currently have Rottendog System 11 boards in stock and even Rottendog is out of stock. The only place I see them for sale is on eBay right now. Not sure if that has anything to do with this issue. "... if the System 11 (nothing) MPU is used in a System 11A game or later, pins 6 and 7 of the adjacent connector (J18) must be tied to the ground plain at the edge of the board. These pins provide the ground for the special solenoids. Without the modification they do not work." I will be attempting this mod to bring an F-14 back to life. The original MPU is in rough shape, but I have a spare out of a GL that is nearly perfect, at least cosmetically. This is my 4th System 11. Love them! I swapped the boards, but the F-14 won't boot up. Curiously enough, the GL board already had the mod to connector 1J18. It makes the start tone and lights the GI, but hangs there. The eight segment display does not show anything at all. I checked power and they are all good. My question is, will the 8 segment display work at all on a System 11 board that is installed in a System 11A game? I ordered new ROMs in the meantime. Agree that the Sys 11a is the most versatile board of the four boards for sure. Does the board boot up on the bench, out of the game? The earlier posts on this thread indicate otherwise. I don't have any way to bench test it without buying more crap. I do have a GL that I could throw it into. I installed new ROMs U26 and U27 and it still won't boot. You don't need anything fancy, can't you borrow an old computer supply from someone? The best power supply for your CPU is one of those switching video game power supplies, or an old computer power supply. You need to get +5 and +12 volts, and ground from the power supply. On computer power supplies most of time red = +5 volts, yellow = +12 volts, and black = ground. Hook up the power supply to the CPU board using aligator clips. Here's the pinout for the power connector 1J17 on the CPU board. With the CPU on the workbench and issolated from the game, you can test the board much easier. Note the usage of -12 volts. You do not need that voltage to test the CPU board. It is only used for the audio section of the CPU board. Thanks. I took the MPU out of my GL, did the mod, and got it to boot. The other two MPUs I have must be bad, so they'll go to Coin Op Cauldron. In the meantime, I'd like to get the F14 at least playable. The GI doesn't work, which doesn't surprise me because it didn't work in GL either (that game has other issues besides the MPU). Also, the ball feeder doesn't work. The coil is not being told to fire and there is a pretty good burn mark in the vicinity of the transistors. Also, one of them looks to have been replaced recently. Finally, the bottom two displays are out. Not sure if there's an easy fix for that and I don't have a spare because they are different from GL's. Everything else seems to work when I feed a ball by hand. Flippers and Yagov kicker are strong. So it appears the Rottendog MPUs are no longer available. I'll have to fix my one partially working MPU if I want to play this pin anytime soon.